The Azerbaijani authorities are using international criminal warrants to pursue their critics abroad. It looks like they’re getting away with it. After his detention at Boryspil airport by Ukrainian authorities, Azerbaijani journalist Fikret Huseynli now faces extradition back to Baku. Image still via Front Line / YouTube. Some rights reserved. You’d think that escaping a state where one has been persecuted is enough to start a new life. But this isn’t the case for Azerbaijanis who have found themselves on the government’s radar for criticising the regime — even from abroad. On 14 October, Fikret Huseynli, an Azerbaijani journalist and Dutch citizen, was detained by Ukrainian border police at Kyiv Boryspil airport on an Interpol red notice. Huseynli was baffled by the border police’s desire to detain him, and it looked at first that the case would be resolved quickly. But Huseynli remains in Ukraine after a local court decided to hold him in custody for a further 18 days, pending examination of his appeal. Reporters Without Borders issued a statement urging Ukrainian authorities not to “abet the attempts of regimes such as Azerbaijan’s to extend their persecution beyond their borders”. As Huseynli told the Institute for Reporters’ Freedom and Safety, employees of Azerbaijani embassy in Kyiv showed up at the airport after his detention and were present during Huseynli’s questioning. This isn’t the first time the Azerbaijani government has tried to pursue its critics abroad. But Huseynli’s detention raises concerns around the use of Interpol’s red notice system, especially when it is used by undemocratic regimes like Azerbaijan, Belarus, Iran, Russia, Turkey and others. Interpol issues colour-coded notices, the most powerful of which is the red notice — described by one publication as the “closest instrument to an international arrest warrant in use today”. But for years now, rights-focused groups, including the European Commission, have argued that whenever an authoritarian regime requests a red notice, Interpol does not carry out detailed background checks against the people who are being flagged, nor is there external oversight of its operations and decisions. In December 2016, the Financial Times estimated that only three percent of red notice applications are properly assessed. Another reason for concern is Interpol’s senior leadership, which includes Alexander Prokopchuk and Meng Hongwei — one is the former head of Russian interior ministry department, the latter is China’s vice minister of public security. In 2011, Interpol’s Secretary General Ronald Noble awarded Mehriban Aliyeva, Azerbaijan’s first lady, with a memorial medal for her contribution to the creation of a safer world. Azerbaijan became a member of Interpol in 1992 and the Interpol National Central Bureau for Azerbaijan was opened in 1993. According to the information on Interpol’s website, the aim of establishing a local bureau was to “ensure swift and efficient criminal intelligence exchange between Azerbaijan’s law enforcement agencies and their counterparts in other Interpol member countries”. In 2012, some 172 Azerbaijani citizens were wanted by the government of Azerbaijan — 160 for criminal offenses, 12 for reportedly going missing. I looked for recent indicators and according to the list, there are still 160 people wanted on red notices and 14 on Yellow Notices. Searching for Fikret Huseynli brought no results, although it’s likely that not every red notice automatically appears on Interpol’s online database. Enemy of the state. Interpol’s online database of red notice warrants, showing Azerbaijani citizens wanted by the Azerbaijani government. While not all will be political dissidents, Azerbaijan is one of several states to have developed a taste for abusing this international law enforcement system. Photo CC: oDR. Alovsat Aliyev, a former Azerbaijani national who sought asylum in Germany, was detained by Ukrainian border police in April 2016. Aliyev [unrelated to Azerbaijan’s ruling family] was travelling to Ukraine to attend the launch of the new NGO he had founded — Legal Assistance to Migrants. At Boryspil airport, on his way back to Germany, Aliyev was informed he was the subject of an Interpol red notice. A local court ruled to arrest Aliyev, and sentenced him to 25 days’ imprisonment. He spent 20 days at the detention facility, in terrible unsanitary conditions. Writing about the experience after his release, Aliyev recalled that he and his cellmates had to take turns sleeping, as there were just 20 beds for 27 inmates. During his detention, he was approached several times by representatives of the Azerbaijani government, who offered him extradition. Aliyev refused, fully aware of the consequences if he agreed. He later said that release would have been impossible were it not for the Germany Embassy in Ukraine. High-profile fugures aren’t safe, either. This August, Russia sought the assistance of Interpol’s Red Notice system to request the arrest and extradition of Bill Browder, one of the people behind the campaign to freeze visas and foreign assets of Russian officials suspected of human rights abuses. As prior attempts were not successful, Russia filed another application for a red notice against Browder. Central Asia’s autocracies are particularly enthusiastic (ab)users of the red notice system. On 20 September, Uzbek journalist Narzullo Akunzhonov was also detained at Boryspil airport on the basis of a red notice issued at Tashkent’s behest. Yesterday, Ukrainian border police also detained the Kazakh journalist Zhanara Akhmet, who has now requested political asylum, at Boryspil airport due to another red notice. On 9 October, Greek police detained Tajik opposition activist Mirzorahim Kuzov at Athens airport (Kuzov is a member of the country’s banned Islamic Renaissance Party). The pattern here is all too obvious. Earlier, it was reported that Turkey was trying to return a Turkish man with German citizenship from Spain using a similar method. The swift response by the German government to the effect that the man in question was a government critic (and no criminal) meant that extradition was averted. Similar to Turkey, the government of Azerbaijan issued a warning accusing Huseynli of illegally crossing the Azerbaijani border and of committing fraud in Azerbaijan. In the past, some Azerbaijanis have succeeded in having their names removed from Interpol’s red notice database given their refugee status. Following new policy introduced in 2014, red notices against refugees were no longer permitted as long as certain conditions were met. These conditions included confirmation of an individual’s refugee or asylum seeker status; confirmation that an individual feared persecution in the country that requested the red notice; or that the refugee status granted was not based on political grounds vis-a-vis the requesting country. For example, Azer Samadov left Azerbaijan in 2003 after being persecuted for opposing the regime and later emigrated to the Netherlands as a refugee in 2008. A year later, Azer learned he was on Interpol’s list when he was detained at Amsterdam Schipol airport. It took Samadov eight years to rid himself of the red notice. What makes Azer’s story interesting is his prior relocation to Georgia — a common trend for many Azerbaijani political activists. Though he moved to Georgia in 2003, Azer was arrested in 2006 by Georgian counter-terrorist forces at the request of the Azerbaijani authorities — a familiar story in light of the repression faced by Azerbaijani journalists and activists over the last few years in Georgia. As the recent report “Repression Beyond Borders: Exiled Azerbaijanis in Georgia” notes, while many Azerbaijani political activists have taken advantage of Georgia’s liberal immigration policy and NGO-friendly environment, the close relationship between the Georgian and Azerbaijani governments has put significant pressure on Azerbaijani exiles. The atmosphere has only deteriorated following the Aliyevs’ further consolidation of power through Azerbaijan’s 2016 constitutional referendum. The story of Afgan Mukhtarli, an Azerbaijani investigative journalist who was abducted in Tbilisi in May 2017 in what looked like a well-planned and orchestrated kidnapping, has raised further questions. Georgian investigations into Mukhtarli’s disappearance are yet to yield any results. The report also highlights safety concerns of other Azerbaijani exiles, including cases where Azerbaijani citizens have had applications for residency permits and asylum rejected. One such person is Dasghin Agalarli, who was also on Interpol’s Red Notice system, and who had his asylum request rejected. Agalarli has since left Georgia — and so have a number of Azerbaijanis who at some point took refuge there. Mukhtarli’s wife, Leyla Mustafayeva, decided it was no longer safe for herself or her daughter to remain in Georgia, and recently sought asylum in Germany. Hundreds of opposition activists attended an anti-corruption protest in the Azerbaijani capital of Baku on 23 September. 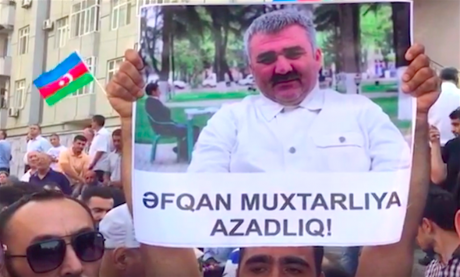 “Free Afgan Mukhtarli!” reads this poster. Image still via YouTube / RFE/RL. Some rights reserved. 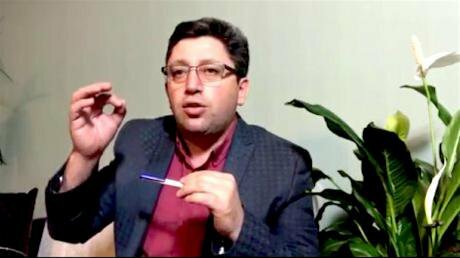 In 2014, Azerbaijan managed to extradite Rauf Mirkadirov, a prominent Azerbaijani columnist and journalist who had been living in Ankara since 2010. The veteran journalist was baffled to learn that his press credentials had been revoked together with his residency permit when crossing the Georgian border. Mirkadirov was handcuffed in front of his wife and daughter and then taken to the airport, flown to Azerbaijan where he was arrested by local police on charges of high treason. Mirkadirov was sentenced to six years’ imprisonment, but later pardoned by the authorities. He fled to join his family following his release. The persecution of Azerbaijan’s critics both inside and outside the country is nothing new, but it is clear that the measures taken by the Aliyev regime are becoming more extreme. Back in Azerbaijan, there are more and more reports of Azerbaijani citizens being targeted for their participation in recent political protests. On 23 September and 7 October, the National Council of Democratic Forces organised anti-corruption rallies. Although several weeks have passed since, members of opposition parties as well as non-party affiliates are still being targeted by the authorities. A recent case was the dismissal of a long standing veteran actor from the Azerbaijan Drama Theatre. Just few days earlier, a post office employee reported being fired from her job after attending the opposition rally. Others dismissed include a professor teaching at Azerbaijan State Economic University and a doctor who has been fired from his job at the dental clinic. At least 90 members of the Popular Front Party have been called into questioning, threatened, arrested, or fined following their participation at the rally. Other prominent individuals called into questioning include Khadija Ismayilova, an investigative journalist and former political prisoner. Scores of other citizens are prevented from leaving the country, including a number of journalists and prominent critics of the government. Those imprisoned face humiliation, beatings, inhumane cell conditions, extended time in solitary confinement at the mercy of prison guards and administration. As I write this, reports have just emerged on the health of Bayram Mammadov, the 21-year old youth activist sentenced to ten years’ imprisonment for spray-painting graffiti on a statue of Heydar Aliyev in Baku. Due to the poor conditions in which he is being kept, he has developed a serious kidney inflammation, alongside other health complications. Azerbaijani dissidents have innumerable good reasons to avoid extradition back to a country which routinely makes a mockery of justice. With that in mind, it’s time for Interpol to reconsider its questionable system of international red notices — which show the true extent, figuratively and literally, of the Azerbaijani regime’s thirst for revenge beyond its borders.